Why is it that some pictures are more esthetically than others, some camera shots pop out the screen more than others or some graphic effects are more magical than others? Often it has a lot to do with the composition of the image; there is a special “rule” for making an interesting shot or composition. I will explain to you this special rule in this post. What is he rule of thirds? How to apply the rule of thirds? Why the rule of thirds? The rule of thirds is one of the basic principles photographers, cameramen and graphic designers learn at school. It is the basis for creating a well-balanced shot or composition. Although rules are definitely meant to be broken – you sure can make interesting compositions and well framed shots without applying this rule – keeping the principle of the rule of thirds in mind will often work for the better and you will end up with a more desirable result. The rule of thirds consists in breaking an image down into thirds, horizontally and vertically, so that you end up with nine parts, as you can see in the picture below. Keeping this grid in mind when taking a photograph or framing your camera, you can identify four important parts of the image that you can use for placing points of interest. Those points are the places where the lines cross. You also get four lines where you can position certain elements in your photo or composition. When applying digital photo editing, you can crop your picture until key elements are falling near the intersections or lines. 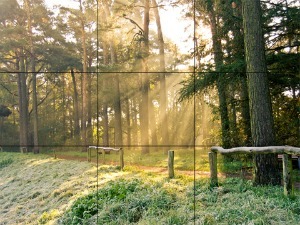 In graphic design or animation it is also desirable to create your composition around the rule of thirds. When viewing an image our eyes naturally tend to concentrate on one of the intersection points rather than to the center of a shot. The human eye looks first at some key structures when looking at an image. Using the rule of thirds will enable the viewer to interact more naturally with the picture. Placing elements on the intersections or along the lines will create more energy and tension in your picture than when placing the elements in any other location in the composition. Points of interest don’t have to actually fall precisely on the lines or intersections to take advantage of this rule. When they come near the lines or intersections, you can already create a more balanced, esthetic feel in your picture. Playing with the light in the picture is also very important to create an interesting result. Make sure each light in the picture is different in brightness and dimension, meaning, one principle light and the others sub-ordinate. Lights of equal appearance will hold and awkward suspension as if the mind can’t make up which part is considered as the sub-ordinate. Also consider making some part of the image as light as possible and some part as dark as possible. These two extremes will create an interesting contrast in the picture and will add an extra dimension to the viewing experience. As you can see this nature picture gives a very well balanced esthetic feeling. See how the rule of thirds is applied here. The horizon is nicely aligned with the bottom horizontal line as is the wooden fence. The spot where the sun bursts through is near the top right intersection and the darker trees in the foreground are covering the last right third of the picture. Also notice the brilliant lighting in the picture, where the sunlight is the main focus light, the left part of the picture is really soft and the trees in the foreground are very dark. This lighting gives the whole picture a harmonious feeling and keeps it interesting to look at. I hope you enjoyed reading this post, I would really appreciate it if you would leave a comment.